Are you confused in choosing between Nikon J1 and Panasonic Lumix GF3? Well, both of these two items are compact digital cameras with interesting features. No wonder that you get confused in choosing between them. Despite being a compact digital camera, Nikon J1 is praised for its decent performance; its continuous shooting speed is exceptional. On the other hand, though, Panasonic Lumix GF3 seems to promise improved image quality with the bigger, more powerful sensor. So, which is the model that you should choose? See the comparisons below to determine your answer. 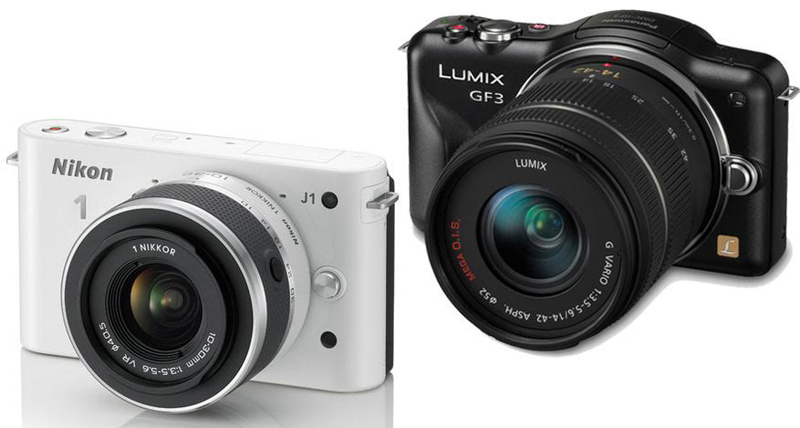 As digital cameras, both Nikon J1 and Panasonic Lumix GF3 are very slim and lightweight. Both models offer interchangeable lens systems. If you uninstall the lenses, you can pocket both cameras easily. They are very lightweight and portable. However, Panasonic Lumix GF3 already comes with a touch screen for a more precise and intuitive control, whereas Nikon J1 still uses buttons. You may have your own preference whether touch screen or buttons are better. Worth mentioning, Panasonic Lumix GF3 also has a wider range of lens selection than Nikon J1. If you plan to invest some money in a collection of lenses, then Panasonic Lumix GF3 can give you more choices. Panasonic Lumix GF3 comes with a more powerful sensor than Nikon J1. Panasonic Lumix GF3 is armed with a 12 MP 4/3” sensor. Nikon J1 has a 10 MP 1.0” sensor. The pixels are also bigger. The higher resolution will allow you to produce bigger images without compromising the quality, and the wider pixel area can translate into more accurate colors and dynamics. However, performance-wise, Nikon J1 is actually more powerful. To begin with, it starts up faster and has less shutter lag. Both will allow you to catch all the moments without missing a thing. The maximum shutter speed is better, up to 1/16000 seconds. Have we mentioned that the continuous shooting is astonishing? Despite the small body, the camera is actually able to shoot at up to 57.9 fps. Yep. That’s astonishing. The AF system is also good, having on-sensor phase detection already to improve the live view and video performance. Nikon J1 has a bulb shutter to allow you to control the exposures manually. In general, Nikon J1 is more recommended because of the better features. However, if you are just looking for a simple point-and-shoot camera, then Panasonic Lumix GF3 should be your choice due to the better sensor.